Kamuli election; is it another score for the EC? 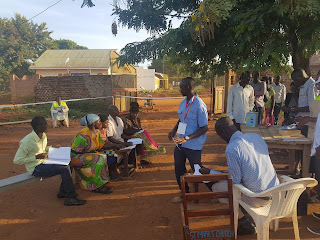 It was a generally peaceful and promising election until about noon when allegations of voter bribery and doubts about police’ impartiality started filtering through the grimy Kamuli Municipality. Earlier, on 12th April the municipality had woken up to a lively but incident-free Kamuli Municipality MP by-election – pitting NRM’s Rehema Watongola against FDC’s Salaam Musumba alongside three other independent candidates. Polling stations had opened in time, voters were streaming to their polling stations in a re-assuring fashion, the voting machines were functioning well and EC seemed like it was generally on top of things. At Happy Hour Primary School, Muwebwa Ward, Northern Division for instance over 50% of the registered voters had already cast their vote by 11:30am on the polling day. Male youth were a common sight at polling stations. A few minutes after midday, ugly scenes of violence around St. Mark Church polling station located somewhere in the corner of Kamuli town stole the thunder. The cat and mouse chase between police and FDC supporters begun. Allegations of voter bribery got more intense as FDC pointed out that police was protecting those involved in acts of voter bribery. Police seemed quite unbothered about the allegations. It strove not to let itself get drenched in the implications of bias and unethical conduct. It went ahead to act swiftly – averting fights among rowdy supporters and arresting those accused of voter bribery and inciting violence. Of course the chase games between the police and the rowdy locals did not confer that needed confidence upon the electoral environment as it slowly unwrapped in the afternoon of the polling day. However, the responsiveness of the Police to threats of the day did a lot in restoring composure of the day – especially in the dying hours of the poll. When items like bows, arrows, knives and military boots were found in candidate Musumba’s Land Cruiser station wagon, police impounded the items and her car, but let Musumba go – I personally felt this move was fair enough to keep a semblance of a sober mood of the day. Had the police arrested and detained candidate Musumba, it is likely that the temperaments in the municipality would have radically changed. Youth exhibited a high degree of vigilance in as much as they remained a potential source of serious violence. At St. Mark Church polling station in Southern division, youth thwarted an alleged voter bribery ploy by some local resident. Security agencies remained on high alert in the afternoon – with at least two police patrol trucks with armed personnel seen in each of the Parishes. The half a dozen armored water cannon anti-riot vehicles that stood in different parts of Kamuli town drew mixed feelings. Some locals felt a sense of security; others remained on tenterhooks anxious about how the day would pan out. As vote counting begun – at about 4:00pm, it was time for security gear to re-position. It was like the sun setting. A few dozens of police in riot gear took position at one of local gas stations in Kamuli town. The monster fearsome riot control vehicles that had parked on Kamuli’s main roundabout facing the road to Jinja since morning, gently but imposingly did a 180-degree turn, pointing their spray nozzles to the restless members of the public most of whom stood at the verandas of the aged commercial buildings in Kamuli town. The police was ready to pounce; but there was not enough reason for it to do so. But this was not the sense just a couple of kilometers out of Kamuli town. The election seemed to be relatively calm on the outskirts. At Mbukatambula polling station where the NRM candidate, Rehema Watongola voted from, it was as peaceful as simple rural life – with locals calmly streaming in to vote and going away. It was at this polling station that a lady Presiding Officer confiscated tens of what appeared to be counterfeit voter location slips from the chairperson of the village. Even when this happened, the mood remained unfazed. This appeared to be the atmosphere in many places surrounding Kamuli town. EC officials at the polling stations seemed knowledgeable about their role in as much as a few regularly sought counsel from candidate agents and observers. Of course staff from the EC offices of Kampala and other districts played a critical backstopping role at various polling stations – a thing that could have contributed to a generally well organized polling process. All in all, what the EC is doing at the moment is akin to playing easy notes for piano beginners or call it picking the low-hanging fruits. The real test will come when it is confronted with a national electoral exercise to the magnitude of a general election. Will it rise to the occasion, then?